Many people are choosing to experience the benefits of CBD oils. Cannabidiol (CBD) is a cannabinoid that’s found in cannabis plants. Along with the more popular tetrahydrocannabinol (THC), there are over 100 cannabinoids found in the cannabis plant. Cannabinoids like CBD interact with the endocannabinoid system (ES) inside our bodies. The ES is made up of a series of receptors spread throughout the body, mostly in the brain, immune system, and central nervous system. The ES is responsible for maintaining balance and harmony in our bodies. When cannabinoids bind to receptors in the ES, there is a chemical reaction. The Koi Stik is a vaping device for delivering CBD vape juice. It offers beginners an easy choice for experiencing the benefits of CBD vape juice without having to take CBD oils. It’s simple, quick and easy to use. It’s also discreet enough to slip into your purse or pocket and won’t produce large clouds of vapor like regular e-cigarettes. 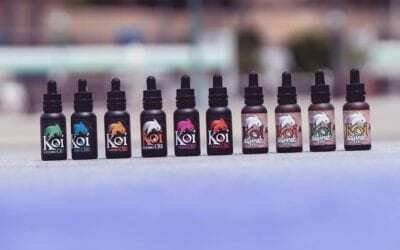 For non-smokers, the Koi Stik is a great way to sample and use CBD vape juices. CBD vape juices also allow you to try a variety of different flavors. We currently have six CBD e-liquids available. When you first purchase the Koi Stik by Boulder©, it’s a good idea to charge it. To charge the Koi Stick simply pull the battery part away from the main body of the Koi Stik and plug it into any USB port. Your Koi Stik will come with an empty cartridge and a filler bottle for filling the cartridge. Place your CBD vape juice into the refill bottle. Next, take the plastic lid off your Koi Stik cartridge and fill the small reservoirs with your CBD vape juice. Make sure that both sides are full and then replace the cap. Now place the cartridge back into the Koi Stik. You need to allow at least 5-10 minutes for the CBD e-liquid to soak into the cotton wicking inside the cartridge before attempting to vape it. Once you have allowed the wicking time to soak, it’s time to turn on the Koi Stik. You simply press the on/off button rapidly three times to turn on the Koi Stik. This is a safety feature to prevent it accidentally firing while it’s in your pocket or bag. Now it’s a simple matter of pressing the firing button while inhaling on the Koi Stik. Start off slowly, with small inhales. Once you get comfortable, you can take longer inhales. There is a small viewing window which will show you how much CBD vape juice you have left. It’s important to ensure that you don’t run the Koi Stik cartridge down too low as the coil and cotton will burn. You should get multiple uses out of a single cartridge, but mixing flavors will change the taste of the CBD e-liquid. If your coil tastes burnt, then it may be time to replace with a fresh cartridge. Thinking About Giving Your Pet CBD? Would it be okay to use my cool fire 4 with aspire tank to vape Koi gold? I purchased the stick but I’ve been vaping 4 years and I’m comfortable using the innokin cool fire.this is my first experience using CBD vape oil…. thanks for your reply.. Yes, it’s totally fine if you using your cool fire 4 with aspire tank to vape Koi gold, or any of our other vape juice flavors. The coils in a standard vape do not interfere/filter with the amount of cbd inhaled? No, the coils in a standard vape pen or mod will not interfere or filter the amount of CBD you receive when inhaled.